Examining ways to mitigate carbon emissions from automobiles and other forms of transportation. 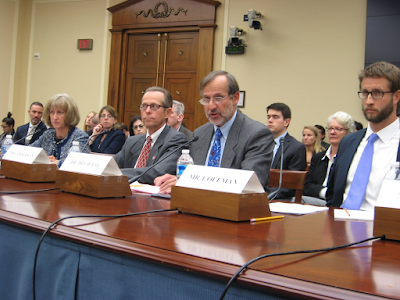 Following the recent hearing on the Renewable Fuel Standard (RFS) held by the House Science Committee, the subcommittee chairs asked me to respond to some questions for the record, following up on my testimony at the hearing. Here are the questions and an abbreviated version of the answers, summarizing my full written response. In his testimony, Mr. Coleman referenced cellulosic ethanol that is "129 times better than gasoline on carbon emissions." Based on your research, is this a reasonable claim? No, that is not a reasonable claim. Such assertions are based on paper studies of hypothetical ethanol production methods. There is indeed a literature on the subject that applies lifecycle analysis (LCA) to proposed cellulosic ethanol production methods and projects that the resulting systems would not only fully offset tailpipe CO2 emissions but also offset other CO2 emissions such as those from fossil-based electricity generation. However, as pointed out in my testimony (and in papers explained elsewhere on this blog), the LCA methods used to justify such claims are scientifically incorrect. Moreover, the cellulosic processing methods involved remain speculative as far as any meaningful commercial-scale operation is concerned. In short, claims of biofuels that achieve a more than 100% reduction in carbon emissions are rooted in flawed analysis of fantasy fuels. There's no doubt that shifting political opinion toward effective climate action is going to take a lot of persuasion, especially of individuals and policymakers who don't already believe in the urgent need to drastically limit greenhouse gas emissions, or at least tend to rate the environment high on their list of concerns. But advocates trapped in the mental boxes of green-group group-think -- and that includes the dear former California governator, Republican though he may be -- are unlikely to change the minds of those in the most need of persuasion by approaching the issue as touted in this recent piece, "Did The Governator Just Come Up With A Republican-Proof Argument On Climate Change?" on Think Progress. The question that Mr. Schwarzenegger posed on Facebook was along the lines of "What room with a sealed door would you be rather trapped in, one with a gasoline car running at full throttle or one with an electric car running flat out?" (on treadmills, we presume). When do biofuels really balance carbon? Background: "Traffic at Night" by Sebastian Grünwald via Wikimedia Commons. Picture Window theme. Powered by Blogger.